Mindmatrix, the ONLY company that offers a single, unified platform for end-to-end enablement of direct and indirect sales channels. Mindmatrix has grown from a small business in Pittsburgh’s Shadyside neighborhood with a handful of employees, to a large organization with a rapidly growing team, 4 offices and a worldwide client base that includes hundreds of companies across various industry verticals. 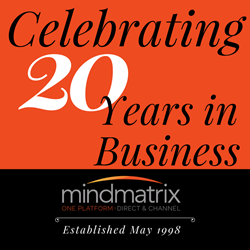 Mindmatrix Inc., the Pittsburgh-based, leading channel, sales enablement and PRM software provider completes 20 years in business this month. The last 20 years has seen Mindmatrix grow from a small business in Pittsburgh’s Shadyside neighborhood with a handful of employees, to a large organization with a rapidly growing team, 4 offices and a worldwide client base that includes hundreds of companies across various industry verticals. Today, Mindmatrix is the ONLY company that offers a single, unified platform for end-to-end enablement of direct and indirect sales channels. As a software platform, Mindmatrix is the most feature-rich channel and sales enablement platform in the industry, with 100+ features spanning across Channel sales enablement, direct sales enablement, channel and corporate marketing, PRM and asset management. Mindmatrix also offers exclusive sales and marketing concierge support services that drive greater partner engagement and adoption of the Mindmatrix platform. Mindmatrix has consistently innovated and introduced new technology and services. In 2013, Mindmatrix introduced the MSP-IT Advantage Program for channel partners of high-tech vendors. The target base included managed service providers (MSPs), Value Added Resellers (VARs), IT consultants, integrators, etc. A unique blend of technology and services, the MSP-IT Advantage Program offers them the most comprehensive marketing and sales enablement package in the industry that includes sales and marketing coaching, business planning, ready-to-use content, sales and marketing concierge support services and CRM/PSA integration. Mindmatrix has enabled over thousands of partners worldwide through this program. Harbinder Khera, CEO and Founder, Mindmatrix says, "In the last 20 years, we have grown tremendously. Today, we are the ONLY single, end-to-end solution in the market for enablement of direct and indirect (channel) sales networks. Our KPI driven approach and the ability to integrate the channel and sales enablement tools with the direct and indirect sales environment differentiate us from others in the space. We are extending beyond just providing a platform, adding value to every stakeholder and driving success for them. " Recognized as a thought leader in sales and channel enablement, Mindmatrix has been a part of various industry conferences, seminars and tradeshows and has also produced several whitepapers and articles on the topics of sales and channel enablement. Click here to read some of our whitepapers or visit our blog for the articles. Click here to learn more about our journey over the years.